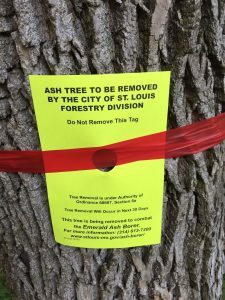 City of St Louis Ash Trees are Under Attack! A tiny green exotic wood-boring insect called the emerald ash borer (EAB) is invading the City of St. Louis’ popular ash trees. 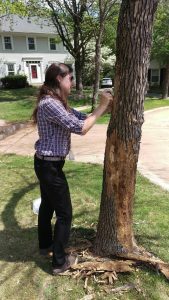 Since 2002, the EAB has been killing all untreated ash trees in cities they have infested. They burrow into the trees, damage their veins and cut off their water supply. Once dry and brittle, ash trees can fall and damage people and property. 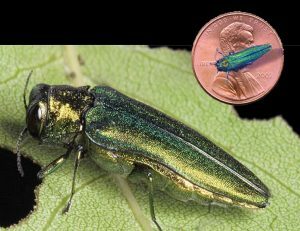 The City of St. Louis Forestry Division takes the EAB problem very seriously and is being proactive before stopping the insect becomes much more difficult, dangerous and costly to manage. It has created a five-year plan that combines the lessons learned from other cities that have been infested by the EAB. For instance, several cities decided not to remove their ash trees until they died. Then they realized they could not keep up with the mounting number of dead trees or the cost of removing them. Replanting for complete replacement of all removed ash trees. Protecting the trees will involve injecting them with an organic botanical treatment every two years. Tree removal will begin soon and continue for the next five years. It will start in Ward 1 in north St. Louis, which has the largest concentration of ash trees. The ash trees slated for removal will have yellow neon tags on them. Please do not remove the tags. Forest ReLeaf of Missouri will lead the replanting of the ash trees. We have been actively securing tree planting grants and working with aldermen to utilize some of their funds that have historically been used for such projects. All removed ash trees will be replaced with one of 40 different tree species so this problem does not occur again. We need your help! Click here to get involved with replanting. ‘Like’ our Facebook page for Updates! Listen to Community Connection w/ Jade Herrell interview Skip Kincaid, Forestry Commissioner City of St. Louis and Donna Coble, Executive Director Forest ReLeaf of Missouri. 15,000+ public ash trees (17%) line city streets and are in parks. There are about 1,000 ash trees that are 13 inches in diameter and in good condition that will be injected instead of removed. About 2,600 ash trees will be removed each year for the next five years beginning in areas with the most ash trees. Ash trees die within 2-3 years of being infested. Tree mortality rates increase rapidly each year and will peak in about six to eight years. For more information, click here to download our informational flyer.